It's Mother's Day weekend and a good time to finally share the events that led up to meeting my second son. His birth is emotionally complicated for me since we had planned to give birth at home. When my water broke at 32 weeks 6 days we headed to the nearest hospital for a preterm delivery. Part 1 of our story can be found here. By morning, the regularity of the middle of the night contractions had dissipated but because I was uncertain of when true labor might begin, I requested to meet with the Neonatalogist and also the on-call OB/GYN. I had every intention to take a nap that afternoon and catch up from lack of sleep from the previous day and night but, both physicians decided to stop by before I had the chance. Mid conversation with the obstetrician, as we discussed my "ideal" birth and reframed some of my expectations to reflect the current circumstances, the contractions returned and this time they were uncomfortable. I had five contractions over 45 minutes, and at the end of our talk I knew that this was the official start of my labor. Still on the antepartum/postpartum floor, assuming that I wouldn't be allowed any food during labor, I ordered the lunch that I hadn't eaten earlier in the day. Then I called Andy and my doula to let them know that it was a good time for them to make their way to the hospital. Nursing staff came in to hook me up to the external fetal monitor (EFM) and within a few minutes I was wheeled off the floor to Labor and Delivery. The power of the contractions was familiar and continued to increase. I was in labor, but the nurses insisted that I remain in bed on my back while they monitored the contractions so that they could confirm it. Andy arrived shortly after I was settled in L&D, and because I had left my room before lunch arrived, and because I was so hungry already, we plotted how to get food and water (I had been told not to eat or drink anything). He bought some chapstick, and retrieved some water bottles and GUs from my room on postpartum. The intensity of the contractions required my total concentration, and because I was confined to the bed, I couldn't rely on position changes. Instead, I dug deep into my arsenal of Bradley techniques--stuff that I had never used or needed for Roscoe's labor. Centered at my cervix, each contraction radiated tight and hot to my hips and lower back. Andy applied counterpressure on my lower back for a few contractions, but lying on my side required that I "push back" to avoid being pushed over, and it became less helpful and more irritating so we stopped. What worked best for the duration of my labor was total relaxation--I never really understood how this technique could work during labor, but it is the cornerstone of the Bradley method and given the constraints of the situation, I was willing to give it a try. Nestled in a bed of pillows and fully supported, I invested my energy in relaxing every part of my body, and then used visualizations to help me focus in on the work of my cervix. I visualized my body making way for my baby. My Ipod was incredibly helpful--while I hadn't had time to load a birthing playlist (or even make one, for that matter! ), for the duration of each contraction I turned on my music and went to other places. I think I listened to the same three or four songs on repeat: Roscoe by Midlake, Dog Days Are Over by Florence and the Machine, Clocks by Coldplay, and I Like It by Enrique Iglesias (don't ask! It was on there, and it worked.). Music always gives me energy to physically push myself, but in this birth, it also served to drown out the myriad distractions in my room: nurses coming in and out to check the monitors, lights flipping on and off, NICU team staff preparing and organizing in their corner for Merritt's arrival. My doctor stopped by for an update and after we talked for a few minutes she checked me and confirmed that I was 4 cm dilated, and 100% effaced. Active Labor! Honestly, I would rather have not known of this "progress" because the contractions were already so powerful. I didn't want to be discouraged, but knowing that I had 6 cm to go was discouraging. I gave myself a moment, and with the pain of the next contraction I forgot all about numbers and welcomed a return to work. I asked for water and freedom to move and labor as I felt most comfortable. 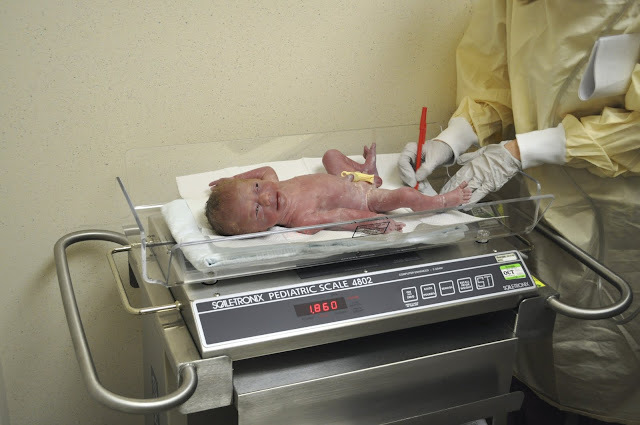 One point not up for negotiation was the EFM--because this was a preterm birth I had to have continuous monitoring, which was ok because the leads were plenty long and gave me enough space next to my bed to move around. 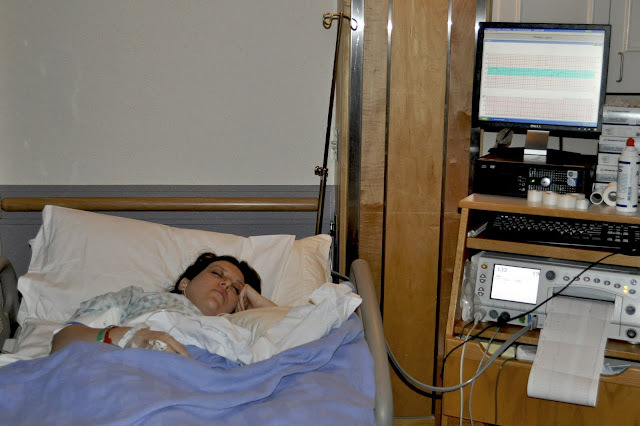 The nurse gave me a hard time about wanting to labor out of the bed, but conceded "as long as the monitors could be read." I was given permission to eat ice chips, which I was so grateful for. I was relieved by the thought alone of maybe finding a more comfortable position. As you might expect, the external monitors were so sensitive that they lost signal anytime I wasn't lying still and, like clockwork, an exasperated nurse would run in to check the leads. My doula arrived, which emotionally relieved a lot of my stress. I really wanted her to be there to help us through the later stages of labor, and I felt much safer once she was with us. We tried some new positions (squatting with the head of the bed raised at a 90 angle, squatting on the floor, sitting on a ball, leaning over the side of the raised bed) and with minimal luck Lori manually kept the monitors in place. My nurse stormed in to announce that I could have ten more minutes, but then it was "back to bed." The different positions were not very helpful at that point anyway, so I took what I could get and we kept at it. Ten minutes later we had found a squatting position that was more helpful than others and when we asked for more time the nurse said, "well I have the solution, I'll just put in an internal fetal monitor!" (The kind that screw into the baby's head). I had heard enough and jumped back into my pillows. 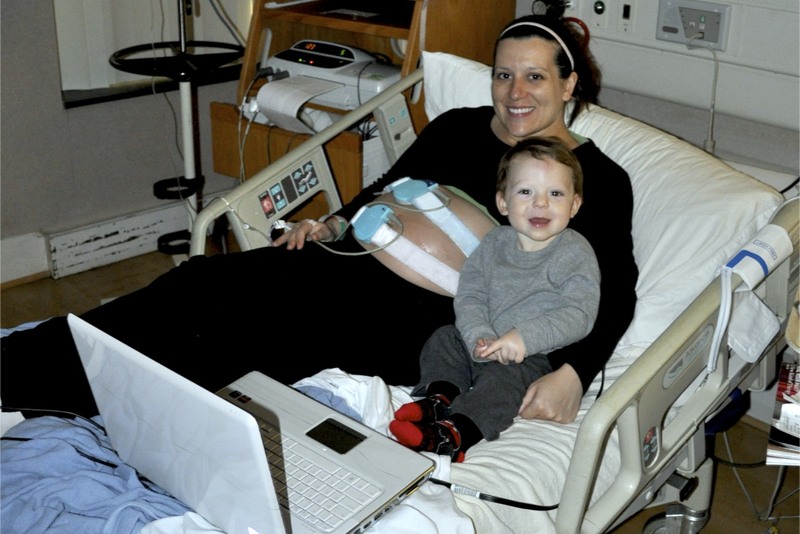 With the monitors registering properly, Merritt's heart rate was decelling with each contraction. Although this is normal, and he was recovering ok as far as we could tell, the nurse continued to come in and out of our room every few contractions, drowning us in fluorescent overhead lights upon her every arrival. Andy and Lori encouraged me with each contraction to take big deep breaths in order to get the most oxygen to the baby. Lori's mantra was "breathe for your baby". I felt lightheaded and the pain was making me feel nauseated. The nurse warned that if I was going to throw up, that I couldn't have any more ice chips. My doula said it was a response to the pain and I confirmed that I wasn't actually going to get sick. Lori gave me some physical support with counterpressure, and both Andy and Lori cheered me on and continued to work with me through each contraction. I silently talked myself through each contraction. I can do anything for 90 seconds. I focused on each contraction independent from the rest, and took full advantage of those quiet moments in between where comfort still reigned. Labor is such a beautiful and mysterious process, and those breaks are built in for a reason. Releasing long, relaxed, exhalations also helped me to manage my pain. By the nature of the contractions, I knew I was close to the end and began searching hard for that feeling to bear down and push, because then I knew relief would come. When Lori and Andy pulled the covers back to help reposition my pillows they found blood and Lori said, "uh, I think she's complete" and went to alert the nurses. In no more than a minute or two, my doctor had arrived, along with several nurses, and an entire NICU team. The room was suddenly bright again and filled with people. I still had no urge to push, although I could feel him moving down. My doctor checked me one last time, noted that I was 10cm dilated and declared it was time to push. I also remember mention of a suspected cord around the neck and placental abruption. I wanted to push on my own terms, but I still didn't feel the urge and while I had been told that I would be allowed to give birth in whichever position felt most comfortable, my doctor insisted then that she wanted me on my back in the traditional birthing position. She insisted too, on directive pushing which is totally unnecessary in a natural birth especially, and another common practice not at all supported by the literature. After a few minutes I could feel the transition from labor contractions to pushing contractions, but my urge to push was still ramping up. My doctor relied on the monitor to estimate when a contraction was about to happen and then she would begin to count to ten, but by her third count my urge to push was over, and I wasn't going to push any more. She began talking about the baby's safety, and how I needed to get him out, like, NOW. Pushing was forced and more painful than necessary. I will always remember the sterile drapes and her stern and serious face. By the third or fourth contraction I finally felt a real urge to push, and when Andy leaned into me to share his concern that we'd be headed for a c-section if the baby wasn't born soon, I followed her instructions to push, with way more force than I would have chosen if left on my own. As Merritt was crowning, I started to resist and told my doctor that I wanted to breathe through a contraction or two to ease him out, but everyone in the room was insisting that he was right there, and so close to being born. My doctor maintained that I should continue to push, push, push. One of my most vivid memories of this birth is the feeling of shooting a baby out like cannon ball. Merritt was born with the cord wrapped around his neck (she just unwrapped it, no biggie) and a robust cry. His cord was cut after 30 seconds, (not the full sixty that is recommended for delayed cord cutting, but we were thankful for any delay). They let me give him a kiss, and then he was handed over to the NICU staff. 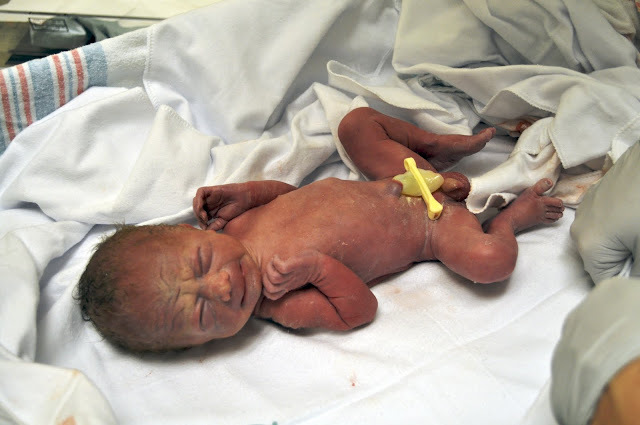 He weighed 4 pounds 1.6 ounces, and was 17 inches long. His Apgar scores were 7 and 8. I delivered the placenta uneventfully and without the use of pitocin. A partial placental abruption was later confirmed. 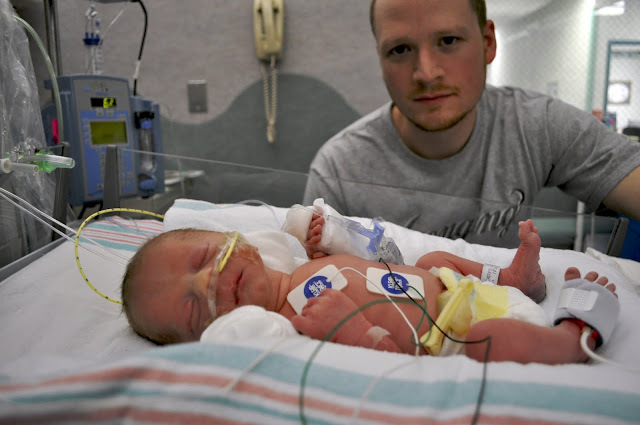 Andy was invited to join the NICU staff to observe and take pictures. I remember looking over to the blur of people revolving around Merritt. Andy was tearfully trying to capture the moments that I couldn't be a part of. Merritt was shown to me one last time, and then taken to the NICU. Andy followed to know the location, but wasn't allowed to stay. The doctor came in with a dinner menu, but we quickly realized that the cafeteria was closed. Andy was instructed by staff to leave the hospital to find food (so horrible! ), but a girlfriend of mine arrived shortly after with homemade enchiladas and strawberry shortcake. We had to spend over an hour on the L&D floor, with promises to see Merritt on the way to Postpartum. Instead, we were taken directly to Postpartum where we were made to wait more. Two and a half hours after his birth, we finally got to see Met and hold him for the first time. Thank you for sharing. I admire you for trying to find the best possible blend of your own desires for a Bradley-type birth while acquiescing to the doctor's plans. It sounds like there were parts that were really, REALLY hard. Oh, I wish you could have had your calm and quiet home birth, but of course it's good that Merritt got the higher level of care that he needed. This is especially poignant to me as I am now 32 weeks. Is the baby inside me that big (and yet that little)? Wow, what a story. I admire you courage throughout the entire process. In times like that, I definitely succomb to what the "experts" deem the best - but you did a great job getting what you wanted intermixed with having Merritt safely. Happy Mother's Day! Thank you for sharing Merritt's birth story. I'm sorry it wasn't the experience you had been hoping for. It's one of those catch 22s...perhaps they were over cautious, but your little guy turned out perfect. Had they been more lax and Merritt's birth had had a different outcome, you may be questioning why they weren't more careful. Just curious, why wouldn't they let you drink anything? I hope you had a wonderful first mother's day as a Momma of two!